englischer Ökonom (1883-1946). 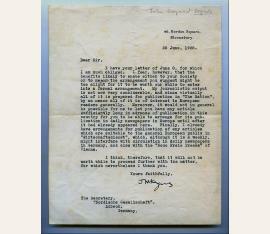 Autograph letter signed ("JM Keynes"). "SS. St. Louis, approaching New York". 1ﬂ SS. 4to. 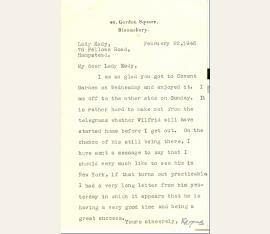 To Oswald Toynbee Falk (1879-1972), a stockbroker and actuary and a close friend of Keynes: "I have had the enclosed letter from Herbert Samuel and have promised to do my best to secure such an article as he indicates. Will you try your hand? I should be very grateful if you would. I suspect that in your usual way you will disclaim the competence. But I would undertake to be the judge of that. In any case you might perhaps fortify yourself with collective wisdom by getting your dining party to discuss it first. I am not sure it wouldn't prove a very instructive topic. If so, perhaps I might bring Mr. Samuel as a guest? I expect to be back in England by the end of the first week of October [...]". - Without the letter mentioned; some traces of old folding and on stationery with printed letterhead of the Royal Economic Society, Kings College, Cambridge ("From Mr. J. M. Keynes, Editor of the Economic Journal")..
John Maynard Keynes (1883–1946), Nationalökonom. Ms. Brief mit e. U. („JMKeynes“). [London], 22. Juni 1925. 1 S. 4°. – An das Sekretariat der „Nordischen Gesellschaft“ in Lübeck: „[...] I fear, however, that the benefits likely to ensue either to your Society or to me from the arrangement you suggest might be too slight for it to be worth our while to enter into a formal arrangement. My journalistic output is not now very considerable, and since virtually all of it is prepared for publication in ‚The Nation’, by no means all of it is of interest to European readers generally. Moreover, it would not in general be possible for me to let you have any article sufficiently long in advance of publication in this country for you to be able to arrange for its publication in daily newspapers in Europe until after it had already appeared here. Finally, I already have arrangements for publication of any articles which are suitable to the general European public in ‚Wirtschaftsdienst’, which, altough it is a weekly, might interfere with circulation in daily newspapers in Germany, and also with the ‚Neue Freie Presse’ of Vienna [...]“. – Kleine Faltspuren, sonst sehr wohlerhalten.